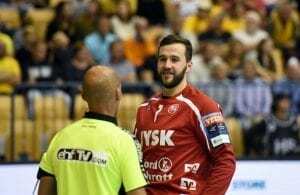 PSG Handball ended year 2018 in the best possible way by beating Danish champions Skjern 38:28 (19:13) which put French champions three points ahead of the first followers – MOL Pick Szeged. It looks that much more interesting will be for the positions which lead to knock-out stage. RK PPD Zagreb beat Motor Zaporozhye 27:25 (14:11) with Zlatko Horvat as top scorer with eight goals. PSG: Uwe Gensheimer 9, Sander Sagosen 8, Mikkel Hansen 4, Nedim Remili 4, Luka Karabatic 3, Henrik Hansen 3, Benoit Kounkoud 2, Luka Karabatic 2, Luc Abalo 1, Viran Morros 1, Adama Keita 1. Skjern: Eivind Tangen 6, Anders Eggert 5, Thomas Mogensen 4, Sebastian Augustinussen 3, Jesper Konradsso 3, Jan Grebenc 3, Christoffer Mikkelsen 3, Benjamin Jakobsen 1.